A demoralizing sorority hazing leads to murder and the suicide of a young girl Angela (Mel Heflin) who mentally snaps under the humiliation of pledging. Ten years later the murdered sorority sister Amber (Kaylee Williams) has a biological sister Dani (Hailey Strader) pledge the same house. No one understands why Dani pledged her sister’s sorority. Every since joining Dani’s struggled to not to let the messed up scenario of living in the house where her sister was murdered bother her. Now she has someone sending her threatening messages, signing them Mrs. Claus. 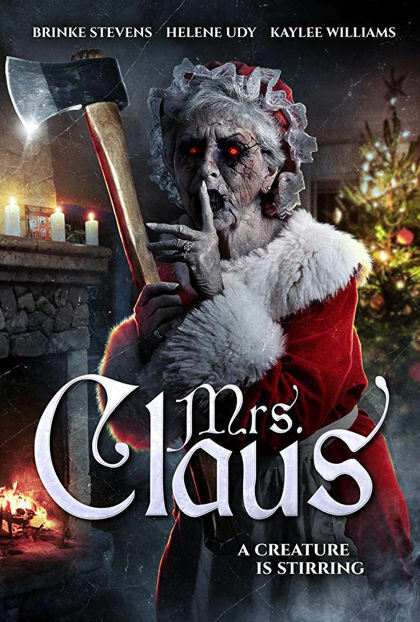 The second feature from writer, director Troy Escamilla is low budget horror with merry practical kills. For the reported ten thousand dollar budget it’s impressive. There’s no doubt when you turn the film on sound isn’t studio quality and lighting has some issues with double shadows and at times being darker than it should. While noticeable, unlike many low-budget horror films the film is kept jolly and the technical issues are mostly able to be overlooked. Acting is perhaps the hardest budgeted aspect of the film to overlook. Escamilla lands a couple of familiar horror faces in Brinke Stevens (Sorority Girls and the Slimeball Bowl-O-Rama) and Helen Udy (My Bloody Valentine) in supporting roles to a group of upstart young actors playing college students. Experience doesn’t always pay off as newcomer Hailey Strader gives the films best performance in her first feature film role while other more experienced actors deliver dialogue that’s cringeworthy.